1930: When two of Captain Steven Hawklin's men are killed and he is attacked by a mysterious masked man, he is reluctantly forced into a race around the world against an eccentric philanthropist, to an uncharted island in the South China Sea. 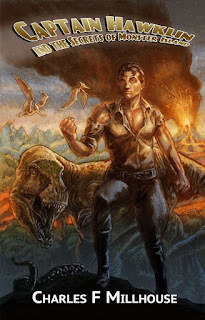 Steven's mission, aide his longtime friend, Oscar "Oz" Lyman in rescuing legendary big game hunter Frank Buck and discovering the incredible secrets of Monster Island. 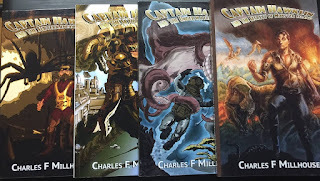 Captain Hawklin and the Secrets of Monster Island is a throwback to a bygone age of pulp adventure stories. Filled with heroes and villains, gangsters and pirates, cliffhangers and suspense, in the tradition, of Commando Cody and Buck Rogers. Join in his adventures, and become a Hawklin Crusader. The only thing Captain Steven Hawklin heard as he ran pell-mell through the deep underbrush was the pounding of his heart against his chest. Or was it the rhythmic beating of the tribal drums in the distance? He wasn't sure. The only thing he was sure of – Kong was dead, and the chances were good that Hardy and Oz were, too. But he couldn't think of that right now... not just yet. He had to stay focused, and remember what chased him. He couldn't slow down, he didn't even dare look over his shoulder in fear he might be eaten… like Kong. His instincts for survival were overriding coherent thought as he ran and hoped everything else worked out. A sharp bee-like sting cut across his face and shocked Steven backed to reality. He threw his hands up blocking the bramble in the dense thicket ahead of him. Blood streamed from a gash on his cheek, down to his lips; he tasted its rusty flavor on his tongue – his stomach soured. Like sinewy fingers the wiry branches tore at his long-sleeve khaki button down and ripped the material like a streamer. The cuffs of his tan trousers dipped in dark black volcanic mud, his Redwing work boots sunk ankle deep. Steven steadied his footing, righting his feet as he navigated down an incline. Then it happened, the mountain behind him exploded, shooting thick globs of ash, smoke and lava into the air. The ground quaked and he stumbled forward to his knees. Steven stared back at the volcano, the heat warmed his face. He wiped a film of sweat from his forehead. He continued his descent down the long, winding path. He was lost and knew he wasn't headed toward the beach where he left the lifeboat. Afraid he was headed further inland, he considered turning around, but the beat of the drums was a reminder of what was behind him. He didn't have a desire to find out how large the island was, nor did he want to come across anymore of the fantastical creatures that inhabited it. Steven heard the squawk of a pterodactyl soaring above him. He froze in his tracks and looked skyward. Luckily it hadn't spotted him and with a sigh of relief the majestic creature glided away. Resolute, Steven pushed onward, quickening his pace clearing the brush, only to be stopped by a towering wall of stone. Trapped. He surveyed the stone barrier. The top of the wall was within sight and his only recourse was to scale it. 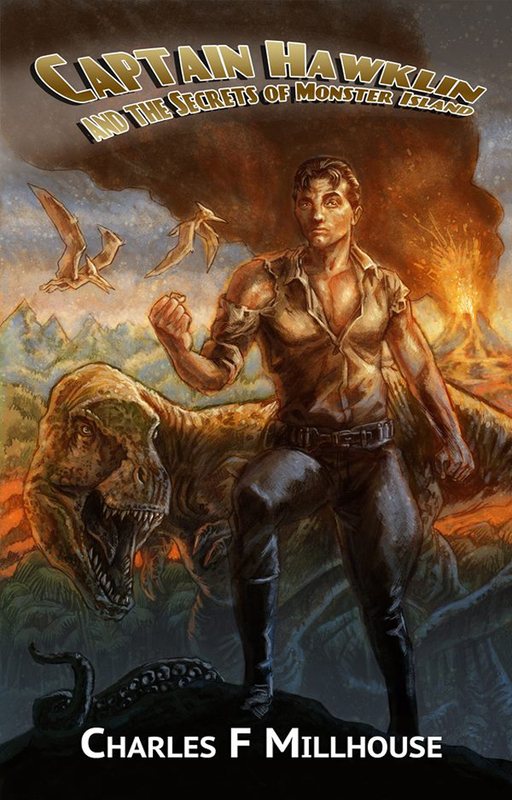 His muscles wound tight as he found a foothold, and began to climb, being vigil of the pterodactyl making sure it wasn't circling back. White knuckled, he dug his feet into small divots on the stone, and climbed, making sure each tight grip on the rock counted. Muscles tight in his legs, he forced himself upward. The volcano exploded again the rock-face buckled and chunks of stone broke away, Steven held tight, his jaw clenched he laid his face against the cool stone holding his breath. When the tremor stopped, Steven moved upward, his pace hurried, he pulled himself to the top – his muscles unraveled and his legs shook. Rivers of steaming hot lava flowed down the mountain carving its way through the jungle line along its base. It looked like a winding snake breathing fire. Just ahead of the flow, at the edge of the tree line he saw two figures, a tall stocky form and an apish-like man running for their lives. When Hardy and Oz spotted him, his two companions stupidly stopped, unconcerned for their safety and began waving frantically at him.